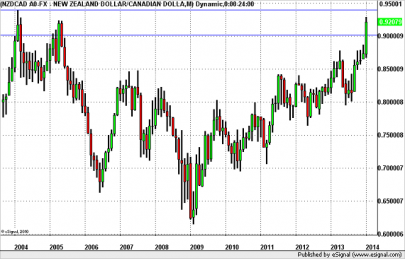 NZD/CAD – In Play Ahead of RBNZ? With a Reserve Bank of New Zealand meeting scheduled for tomorrow, the New Zealand dollar is in play. The RBNZ is not expected to change interest rates but they will be preparing the markets for a rate hike in very near future. Since the last monetary policy meeting, there have been more improvements than deterioration in New Zealand’s economy. Inflation is on the rise, along with manufacturing activity, business confidence and housing. The drop in consumer confidence, job advertisements and service sector activity has been nominal and even though the Chinese and Australian economies have weakened, New Zealand remains buoyant. We expect hawkish comments from the central bank that should drive NZD higher and are watching the currency’s pair’s movement against the CAD. There’s a significant contrast between the outlook for Canada and New Zealand. When they last met, Bank of Canada Governor Poloz said he preferred to see a weaker currency. Low inflation and weak growth in Canada means the BoC could consider lowering rates if the economy weakens further. Hawkish comments from the RBNZ could drive NZD/CAD to record highs. 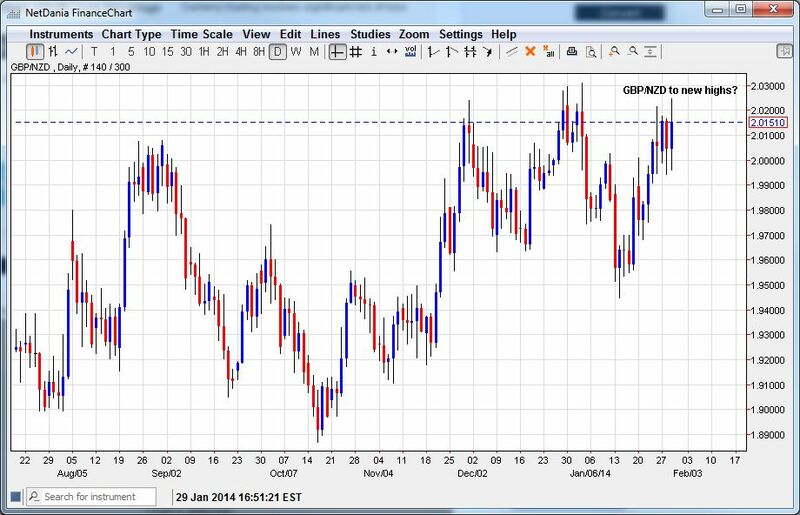 Taking a look at the daily chart of NZD/CAD, the currency pair is closing in on a year to date high. 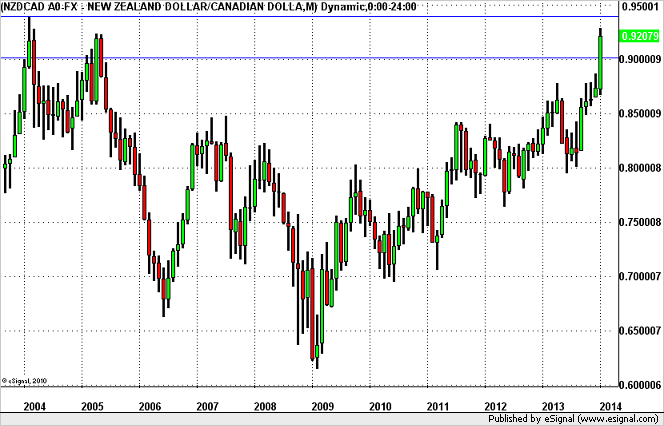 Above 0.9284, there is no major resistance in NZD/CAD until its record high of 0.9383. Support is at the big round number of 90 cents. If this level is broken, NZD/CAD could fall as low as 87 cents. Today the RBNZ backed away from committing to a rate hike at the next meeting in March while the Fed stood firm and tapered another 10 Billion maintaining its tightening stance. 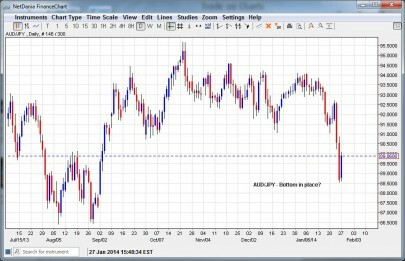 That suggests that risk currencies such as the kiwi may be in for a correction as trader temper their expectations. It is no surprise why RBNZ held back today. With EM crisis exploding and its currency still at very high levels the last thing the New Zealand monetary authorities want to do is push the unit even higher. Meanwhile cable has been holding up very well and despite repeated dovish commentary from Governor Carney, the market is convinced that the BoE will raise rates ahead of the Fed. All of this suggests that the GBP/NZD pair could be headed to new highs over the next week as trader rotate out of kiwi and into the poound. GBP/NZD is within reach of the yearly highs and a break above the 2.0300 level puts the pair on path towards 2.0500 while 2.000 now offers solid support. For the past week, EUR/CAD been consolidating within a tight 200 pip trading range and we think the currency pair is prime for another breakout. Between tomorrow’s Bank of Canada monetary policy announcement and Thursday’s Eurozone Flash PMI, we have enough catalysts for a big move in EUR/CAD. The Canadian dollar is trading lower ahead of the BoC rate decision but the central bank needs to be very dovish to drive the CAD even lower because speculative short positions are at their highest level since May 2013. Economic data has taken a significant turn for the worse and if the Bank of Canada embraces the deterioration, downgrades their assessment of the economy and strengthens their easing bias, EUR/CAD could make run for 1.50 and possibly even break this level if the central bank comments are dovish enough. However the IMF, OECD and Finance Minister Flaherty have talked about the need for higher rates. This pressure combined with a lower currency could discourage the central bank from reacting to one month of deterioration. If the central bank maintains their current monetary policy stance and leaves their views virtually unchanged from the last meeting, a short covering rally in the Canadian dollar could drive EUR/CAD below 1.48. As for Eurozone flash PMIs, a further important would be positive for the euro whereas a surprise deterioration would almost certainly drive the pair lower. 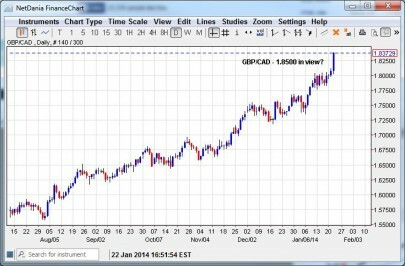 Taking a look at the monthly chart of EUR/CAD, the currency pair is clearly in an uptrend. 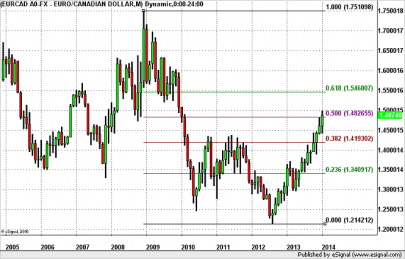 There is no major resistance above 1.50 until 1.5450/1.55, the 61.8% Fibonacci retracement of the 2008 to 2012 sell-off. 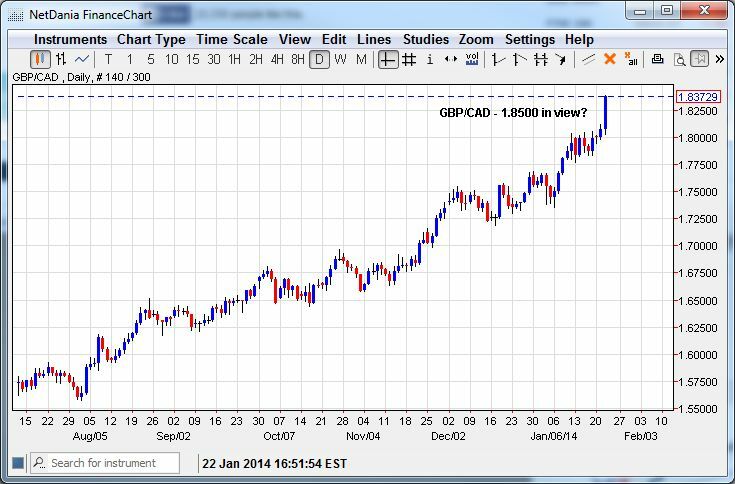 As for support, if EUR/CAD breaks below 1.48, there is no support until the psychologically significant 1.45 level. Technically GBP/CAD has no resistance having broken to fresh highs and may target the 1.8500 level as longs press their case. 1.8000 is the near term support. 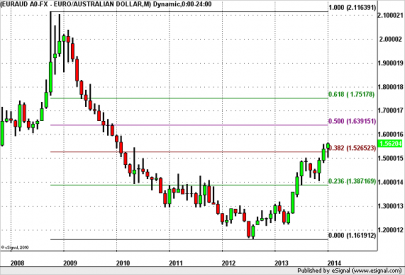 EUR/AUD – Headed for 1.60? 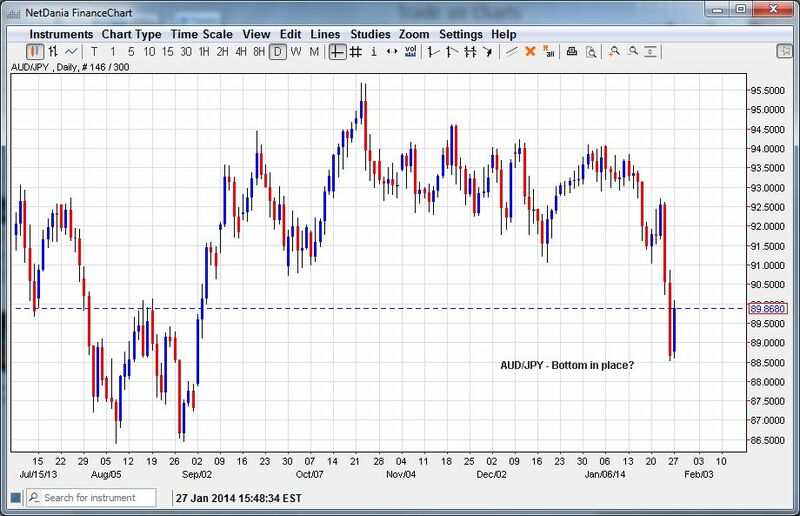 The best performing currency pair today was EUR/AUD. Thanks to better than expected Eurozone flash PMIs and weaker than expected Chinese data, the pair rose to its strongest level since February 2010. The 2% breakout is one of the biggest moves that we have seen in EUR/AUD in months. There is nothing more important for a currency pair’s outlook than economic divergence and in the case of EUR/AUD the gap is growing between the Eurozone and Australia. Manufacturing activity in China, Australia’s largest trading partner contracted for the first time since August while manufacturing activity in the Eurozone grew at its fastest pace since May 2011. This trend is expected to continue with Australia feeling the pain of slower Chinese growth and Europe benefitting from low expectations. 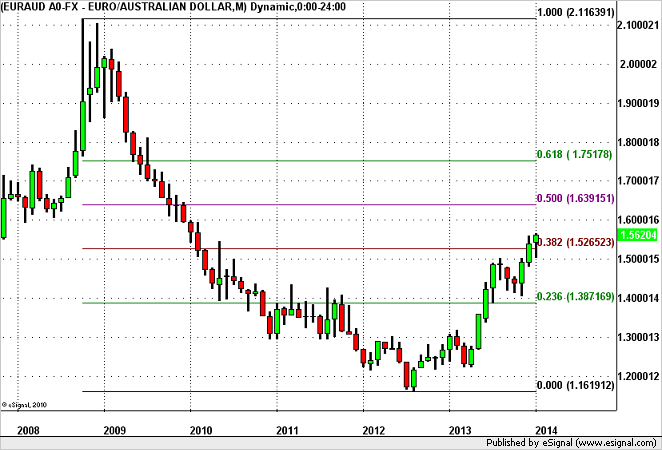 Fundamentally, EUR/AUD should head higher with 1.60 being a reasonable medium term target. Technically, we have to turn to the monthly chart to find resistance in EUR/AUD. 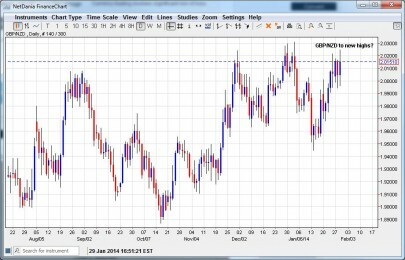 1.56 was an important breakout point for the currency pair. 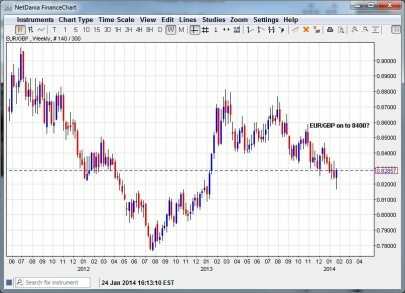 It is now the first level of support and below that, the level to watch is 1.55. As for resistance, 1.60 is the next key level. Not only is it a psychologically significant round number, but it is also the point at which the sell-off stalled in February 2010. 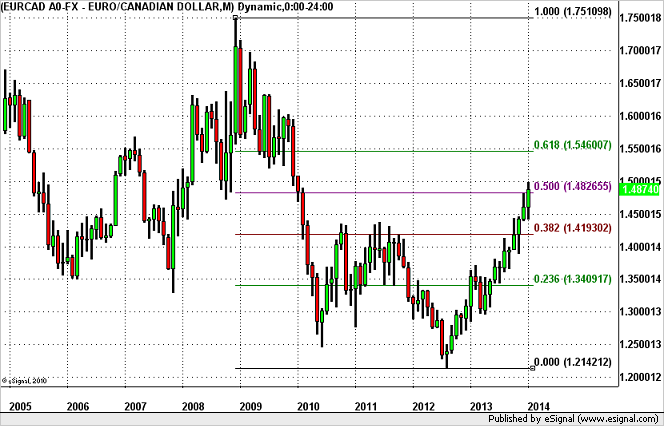 The next level above that would be the 50% Fibonacci retracement of the 2008 to 2012 sell-off at 1.6390. The battle of the two European currencies continues with cable recently winning the war as hotter than expected UK Retail sales data has revived expectations that the BoE maybe forced to tighten rates relatively soon. In fact many speculators are betting that UK will raise rates sooner than US as monetary policy moves towards normalization. However, the latest comments from BOE chief Mark Carney suggest that the BoE is far away from even considering any form of tightening as the Governor expressed concern over the strength of the pound. Indeed the fact that the BoE is worried about the appreciation in the currency, indicates that cable may be in for a correction. In the meantime, conditions in Europe appear to be improving as German PMI’s hit 31 month highs. 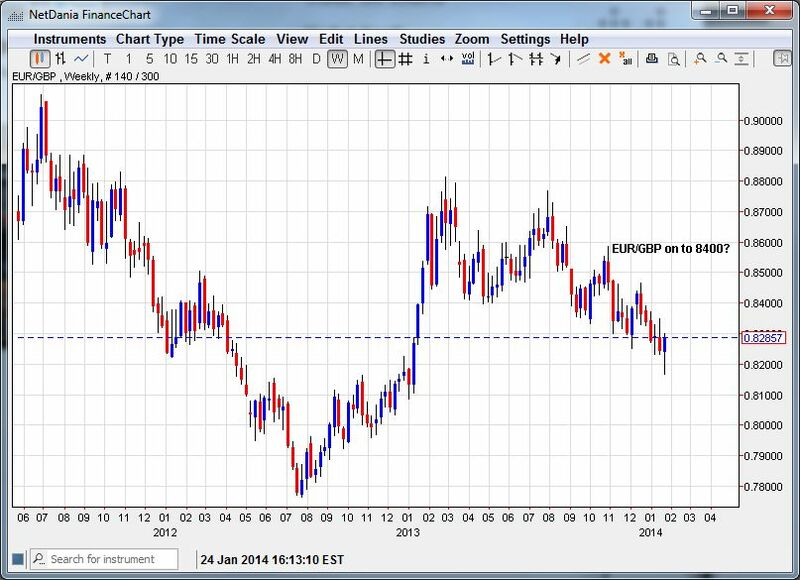 That means the EUR/GBP which has been mired at the lows could begin to stage a rally towards the 8400 figure. After relentless selling the Aussie appears to have found a bottom ahead of the 8650 level and may now consolidate for week or so assuming to further negative data is released from Down Under. At the same time USD/JPY which dropped more than 200 points off its highs on EM worries also looks to have stabilized for now as US equity markets appeared to have calmed. The US data sp far this week has been mixed, but the market is expecting the Fed to remain committed to its QE schedule and that is likely to provide support for the pair for now. Tonight’s NAB Business confidence data could prove to be spark for further rally if it prints no worse then the month prior and that would suggest that AUD/JPY has made a near term bottom. Technically the AUD/JPY has made a higher low at the 88.50 level and as long as that low holds the formation remains bullish with 90.00 now the topside resistance level in the near term.